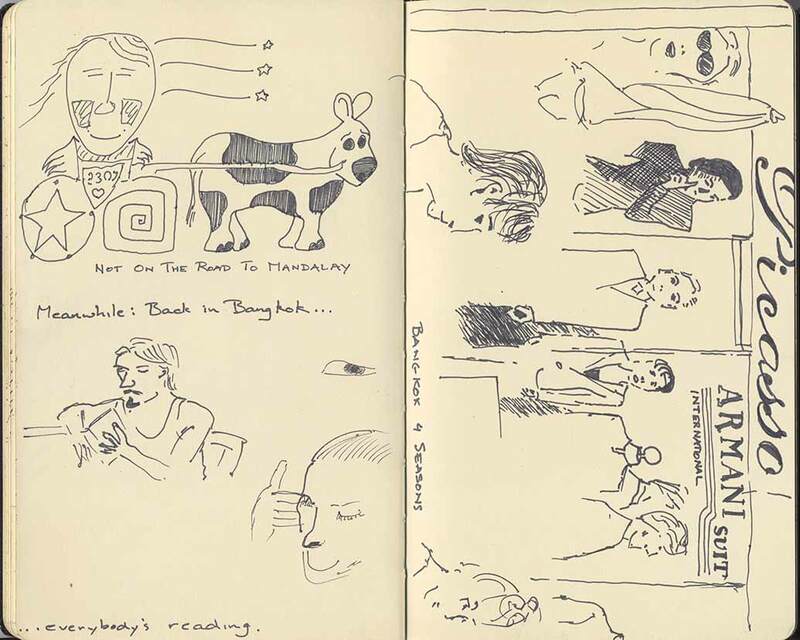 I carried my almost new Moleskin sketchbook with me on our travels. 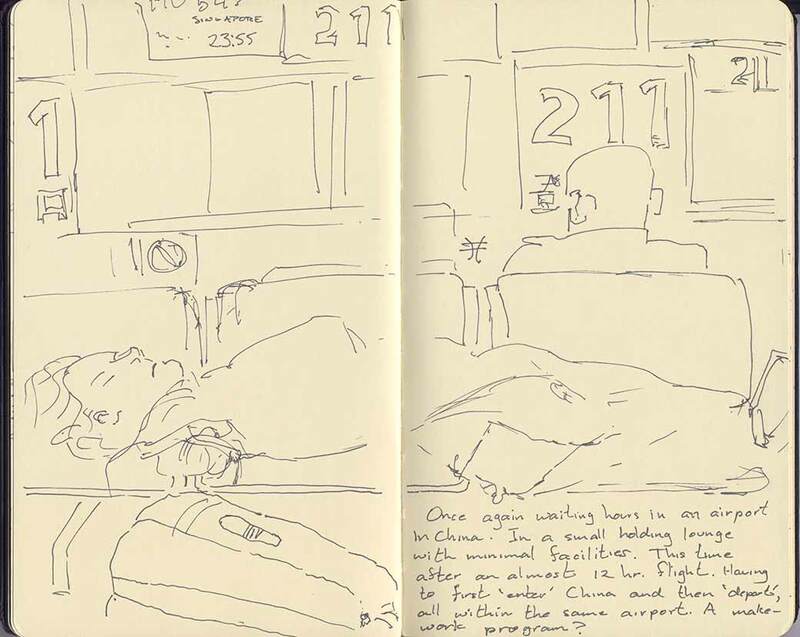 Although I’ve had numerous sketchbooks, and have travelled with several, this is my first Moleskin and also the first time I’ve drawn exclusively in ink. 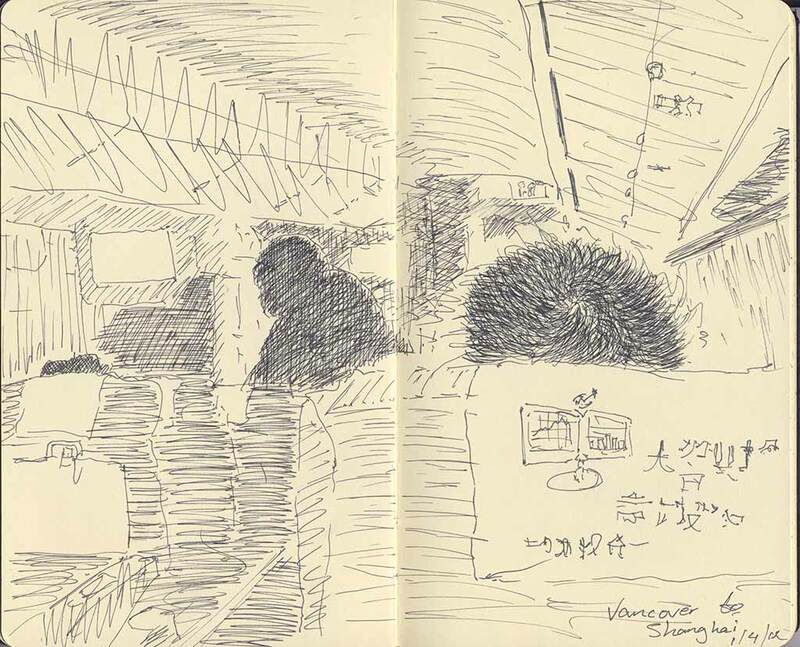 It helped fill in time (sketching on planes and while waiting in terminals), provided a means of meeting locals, gave me some needed practise and helped me focus and concentrate in a different manner than that of taking photos. 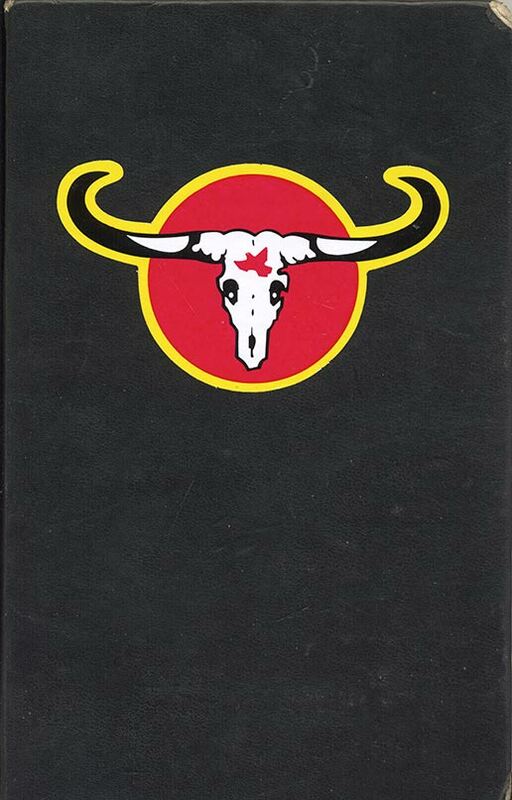 On the front cover is a Carabao Energy Drink sticker that I found in a small store in the Tad Lo area of Laos. I’d seen the sticker around and, being a fan of bovine imagery, had to have one. 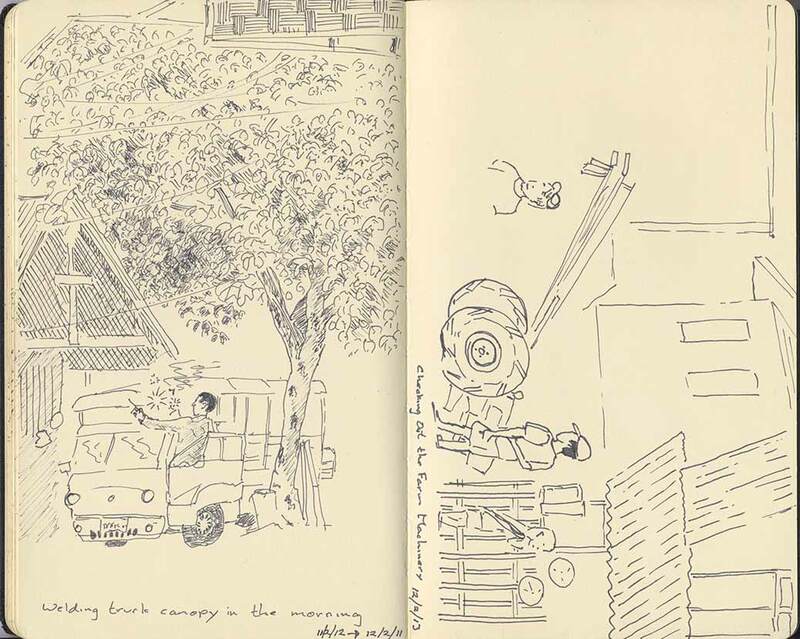 We were waiting for a bus, I was sketching and decided to have a quick look around. Spotting the store with its eclectic range of goods I wandered over. Lo! There was my sought after sticker. I like it when I find things like that and not in amongst a thousand other stickers at some tourist spot (I did see many more in Thailand, where the drink originates). Those 20 hour flights seem to go on forever. I’m not a movie person; I tend to listen to music on my iPod and read books while flying. The semi-darkened cabin provided some shadowy subject matter. I swear I’ll never fly through China again. The immigration process is ridiculous (why do you have to clear Immigration if you’re staying in the airport?) and the airport facilities are archaic (I’ve been in both Beijing and Shanghai airports and they have identical cookie cutter services). Boring. Sue had a much needed sleep. Sue had a nasty cold upon our arrival in Bangkok. So I was left to my devices. Which meant walking a lot and sitting, having a beer and dinner in the evening. Watching the passing crazy scene on Khao San Road. I enjoy sitting and recording the passing scene. The following page was both a joy, as it provided a release of frustration, and a pain, as it’s record of louts we encountered. #1 started the process. It’s a long story but basically during a melee approaching the visa pick-up windows in the Myanmar embassy he jumped up the line by a half dozen people and refused to acknowledge his line-jumping. A fellow he was talking to looked very embarrassed and let us in line ahead of him but behind the interloper. Keep an eye out for him on your travels: white curly hair, designer glasses, American. #2 is a drunken fool who at 4am gave the finger to our passing minibus as we drove by on Khao San Road. There are way too many drunken idiots who should just stay home and not irritate the locals and embarrass fellow travellers. #3 is a woman who took a photo of a food vendor outside the train when the vendor had specifically shaken her finger at the photographer, indicating she didn’t want her photo taken. #4 is a guy from San Francisco who quickly departed our tuk-tuk in Hsipaw, Myanmar without paying his share of the fare. He was one of those guys who talks long and loud about his travel experiences to anyone he corners. 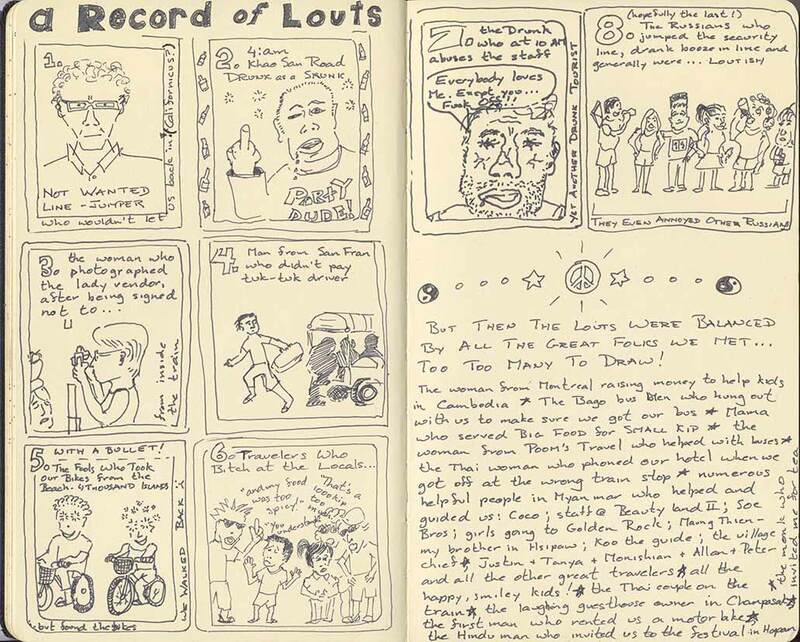 #5 are the fools who took our rented bikes at a beach on 4000 Islands, Laos. Sue had had a premonition when she saw some folks passing a joint on the beach. She thought “Oh, oh. Muddled minds! Watch they don’t take the wrong bikes.” Sure enough. We walked back to the village and found our bikes at another rental place. Undoubtedly one of the staff had to go to the beach and find their bikes. #6 are the French women who decided to argue about a tuk-tuk fare after taking the ride. Sue told them she thought that was inappropriate to wait until they’d had the ride. The women glared at us every time we saw them after that. #7 is another drunken lout. This one was having beer while we had breakfast at a restaurant in Bangkok. He began verbally abusing the staff. When threatened with expulsion he started whining about how they didn’t like him. He was eventually tossed out. #8 are a group of drunken Russian youth who crashed the line for security check in the Bangkok airport. They were drinking all their alcohol they had before they got to the checkpoint. They were so obnoxious an older Russian couple behind us spoke rather sharply to them. The bottom of the page attempts to list exemplary folks we met on our journey. There were way too many for even a written description. In general we met so many great people that the louts were only a minor annoyance. And, I have to admit, I’ve had my loutish moments. Usually when tired or sick. But there’s no excuses for loutish behaviour. Especially when the guest of another country. 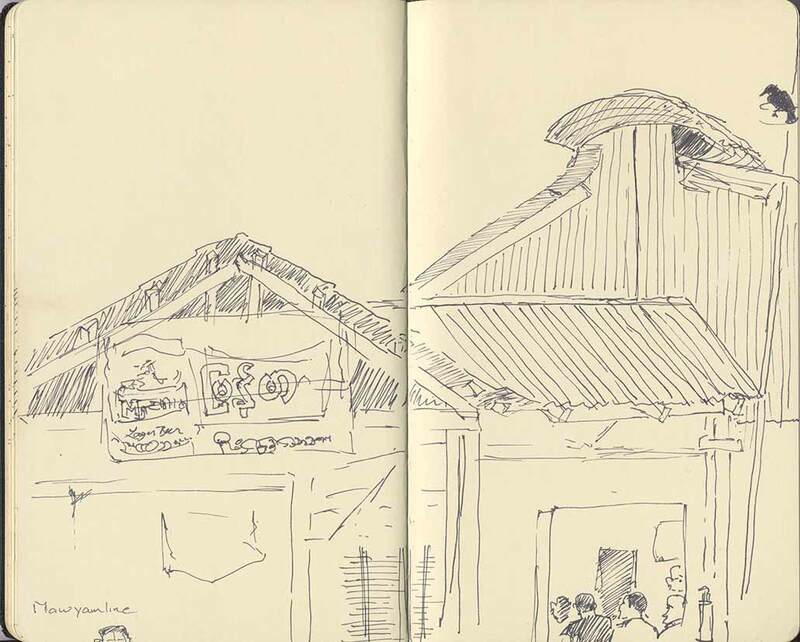 We had visited this riverside restaurant a couple of times in Mawlamyine, Myanmar. 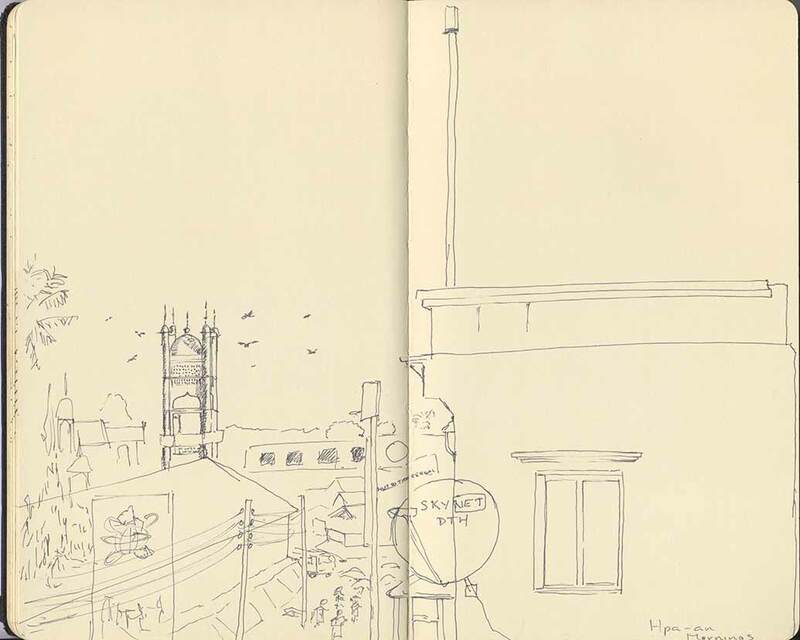 On this particular evening I was by myself so out came the sketchbook. It was a great meeting place and had a superb sunset view over the river. The funky old warehouse it had once been attracted my eye. While staying at the Soe Brothers Guesthouse in Hpa-an, Myanmar we frequently sat on one of their decks enjoying the view and sipping coffee. This sketch was created over several days. I know there’s not much detail but I was drinking my coffee at the same time. My sketches were not all two page spreads. 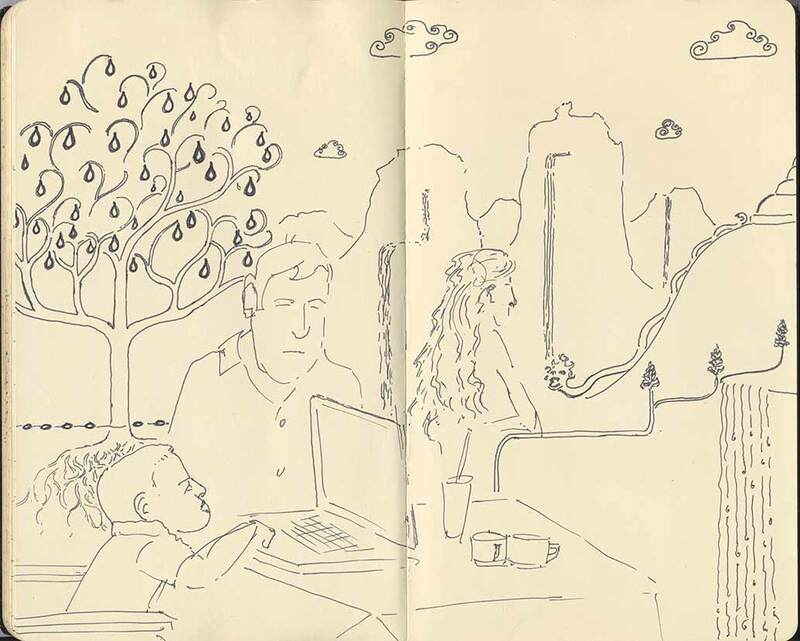 Sometimes I did quick sketches of people; sometimes total fantasy stuff or even a one page sketch of what was in front of me. Although the sketch on the right says ‘Four Seasons’ at the bottom it was created at the Four Sons Restaurant while looking at one of the ubiquitous tailor shops. These two pages were created at the same time. I couldn’t believe the couple making out at breakfast in the restaurant. Sue was oblivious to what was going on behind her. 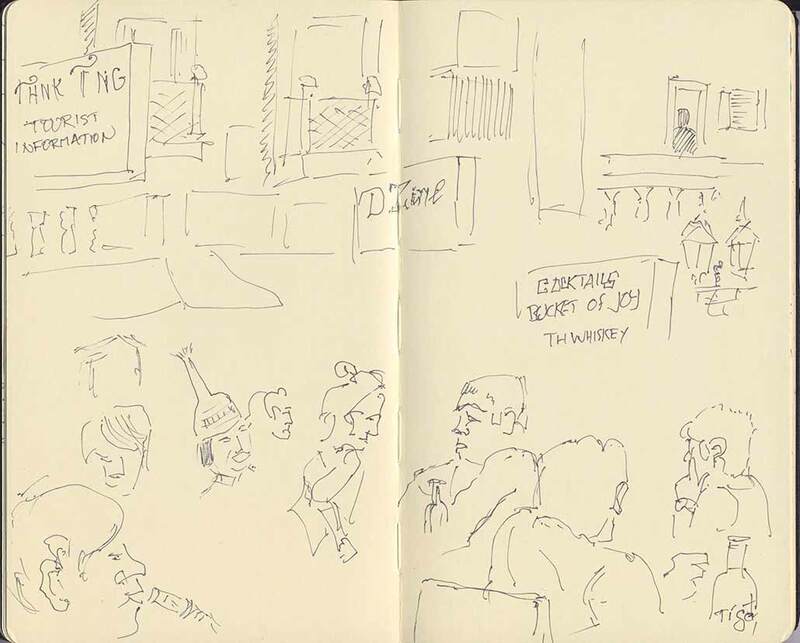 It wasn’t a scene I felt comfortable photographing but was happy to sketch. 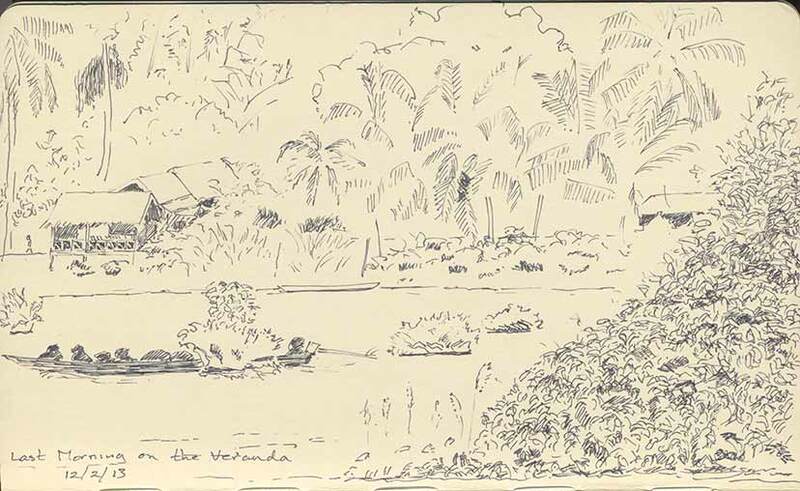 Then I turned around and sketched boats on the Mekong. 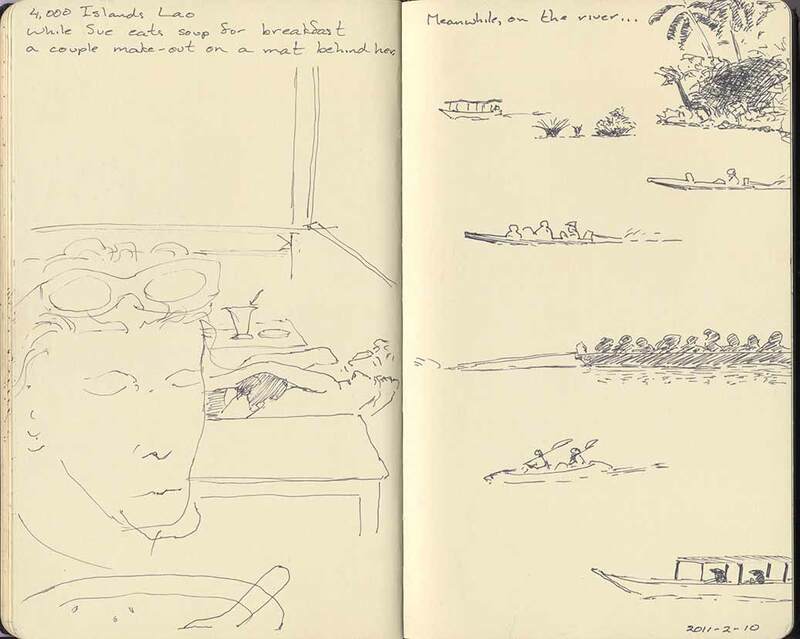 Both these sketches are from the another restaurant but on consecutive mornings. Life doesn’t move particularly fast on the 4000 Islands. But people do work hard. Here: working on a truck canopy and, on the right, discussing a new farm vehicle. We had a great view from our guesthouse deck while staying on Don Khon. We’d relax, drink beers, play Bananagrams or simply watch the passing scene with its many boats and kids swimming in the river. 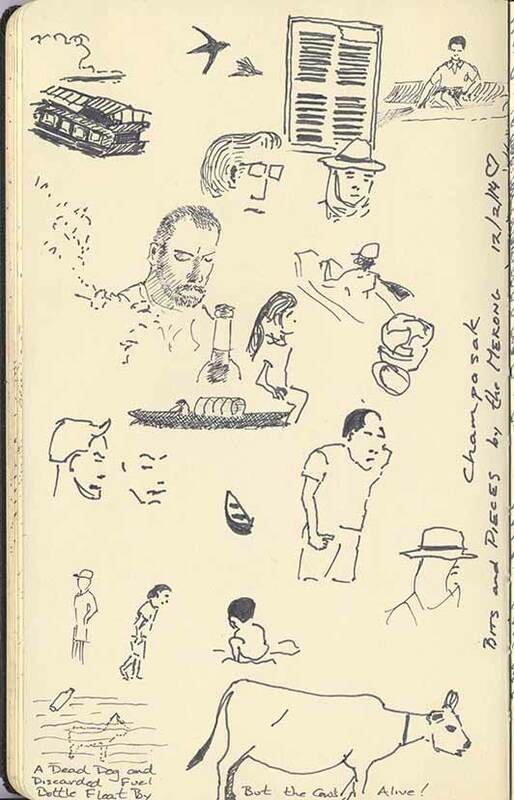 One of the numerous pages of tiny sketches of people, animals and boats. Another sketch that was developed over a couple of days. 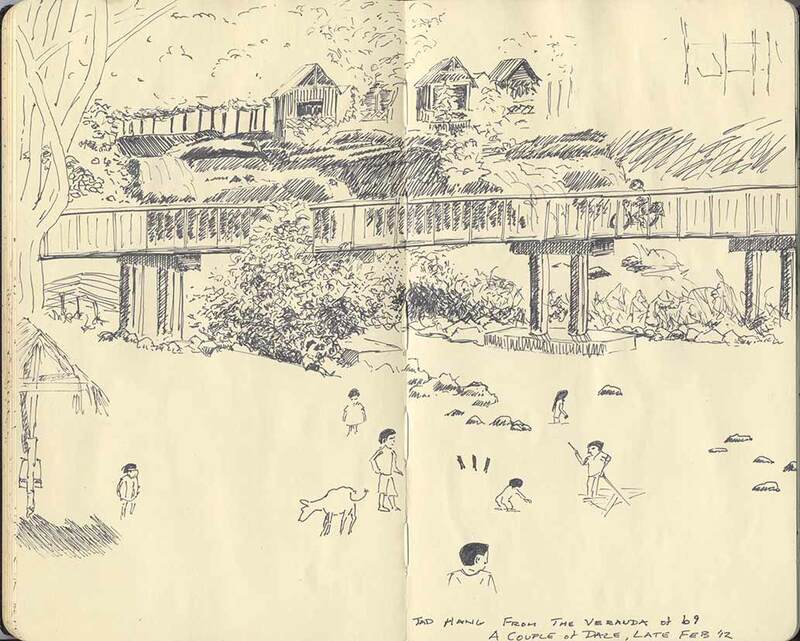 From our deck we could watch the kids playing on and around the river below the falls at Tad Hang, Laos. 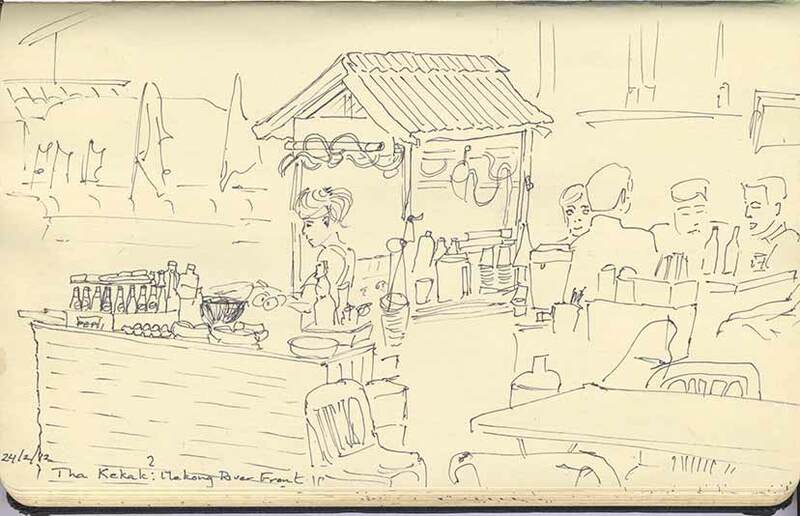 While sitting enjoying a Beer Laos on the bank of the Mekong in Tha Khaek, Laos I sketched the vendor and her stall plus a few of her customers at another table. We went back for fruit shakes later and chatted with her (a photo of the fruit shake is in a previous post). She wanted to come home with us. Her husband had died a few years earlier. Her daughter had had a motorcycle accident that day and was resting in a lounge chair while mom worked. Sometimes people moved on before I could finish a scene. So I just fill the sketch in with a fantasy world. This one started in a Bangkok restaurant where a father and son were breakfasting. 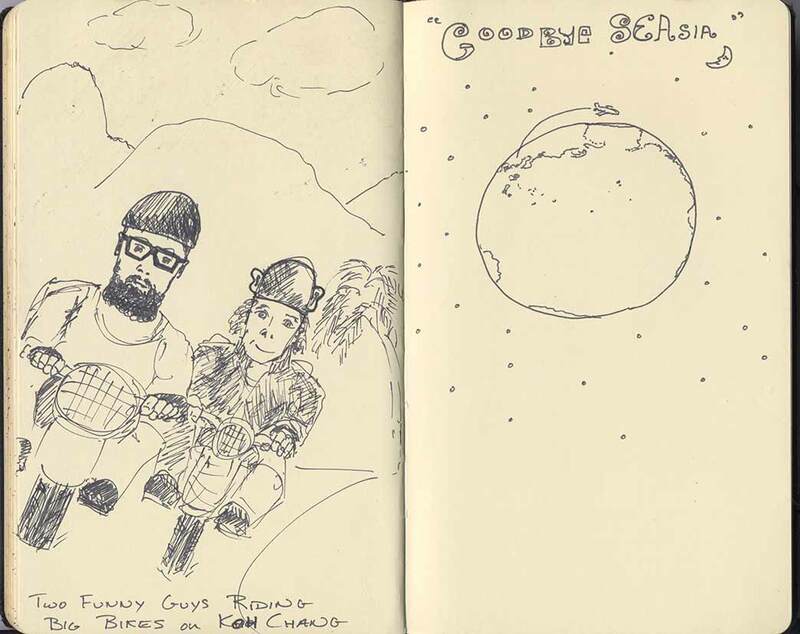 The sketch on the left is the result of missing a photo op so I did a quick sketch to remind myself of the two guys on big bikes roaring by on Koh Chang. The fellow in the rear had plastic ears glued to his helmet. Both looked very happy.